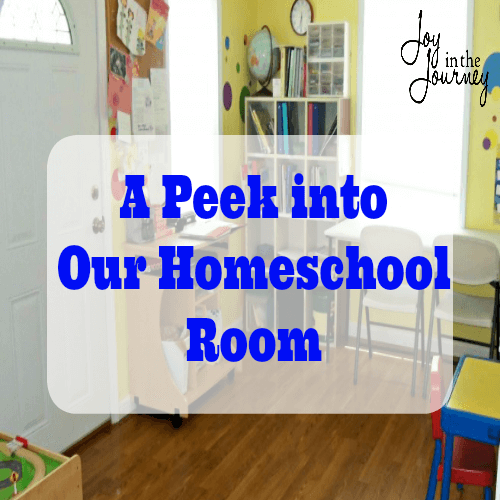 I love checking out others homeschool rooms! 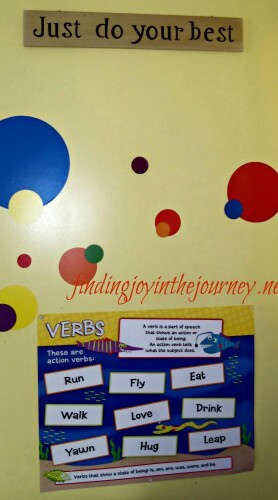 While I know no one needs a room just for homeschooling, we all have some sort of “space” we use for our homeschool. We have been in our homeschool room for 3 years. The room is small by some standards, so organization has helped us a lot! It used to be our front porch but we decided it would be better utilized as extra space after we had our third child. It also serves as our children’s play room. We have changed it a little each year to fit our families needs. One thing that has stayed the same each year is that we have a “school side” and a “playroom” side. This is our “school wall”. 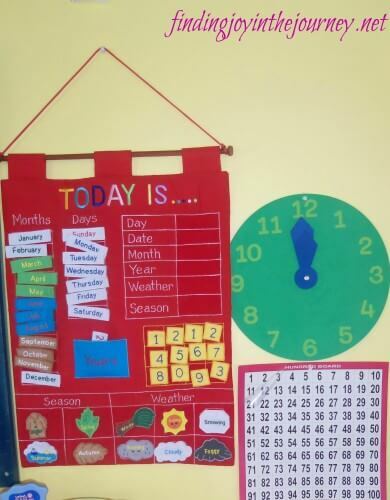 On this wall you will find our fabric wall calendar , a monthly calendar, 100 days of school chart, Alphabet chart, our school schedule, maps, a clock and some grammar posters. I also love our large chalk board and above it is our Mystery of History Timeline. Close up of our maps. The World map is actually a large adhesive map that my husband mounted onto a large piece of plywood. It mounts nicely now and is also dry erase! The other posters were dollar tree finds 🙂 Having our school schedule mounted on the wall is a huge help! We can look here throughout the day and know what we will be doing next. 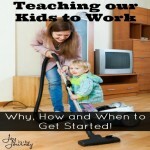 This also helps keep the kids on task if I get side tracked by a phone call, work, or a needy little one. Also along the school wall is the boy’s school table. This little table has been through the ringer and has been used by all my little ones for tot and preschool. 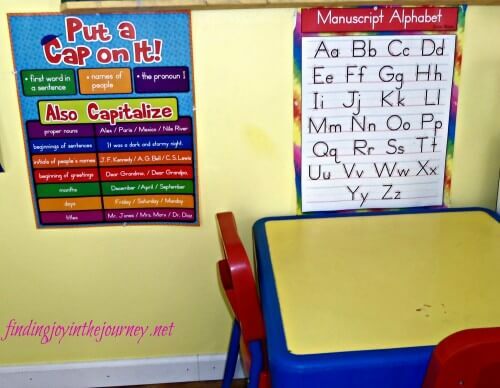 Next to his table is our alphabet chart (another dollar tree find). 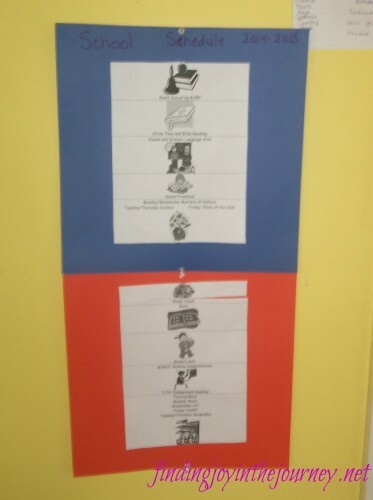 The chart has been used by all of my kids and goes up each school year. On the other wall of our homeschool room we have the girls school table, our organizing drawers, our school cubbies and my desk. The organizing drawers contain our extra crayons, glue, paper and other school supplies. This sign is right above the girls table. It is a reminder (I hope) that they don’t have to be perfect as long as they do their best! On top of our school cubbies I have our junk drawers , my teachers books for the year and our globe. The globe has special meaning to me because it was my papaws, so I keep it up and we only get it down as needed. 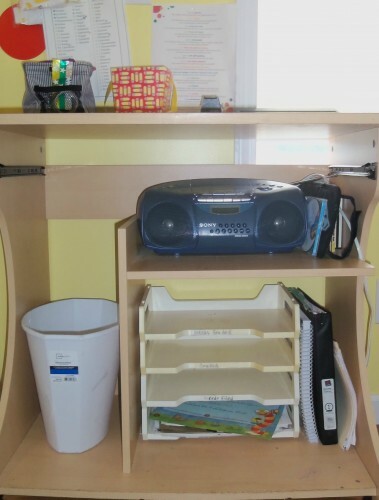 Our junk drawers are one of my favorite parts of our homeschool room organization. It holds all of our flash cards, our “small” items like staples, push pins, paperclips and of course the “missing piece” drawer that houses all those small game and puzzle pieces that get lost. Our school cubbies were actually an old coat rack from a public school. They were given to us by a friend and my husband turned them into school cubbies. 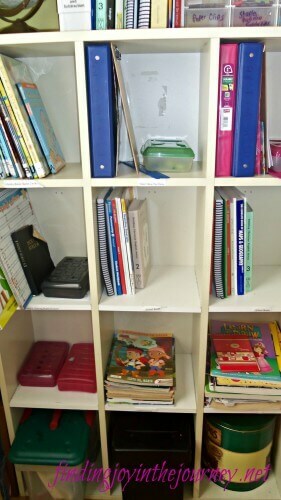 They house all our kids school stuff, library books, our filing boxes, crayons, coloring books and art books. 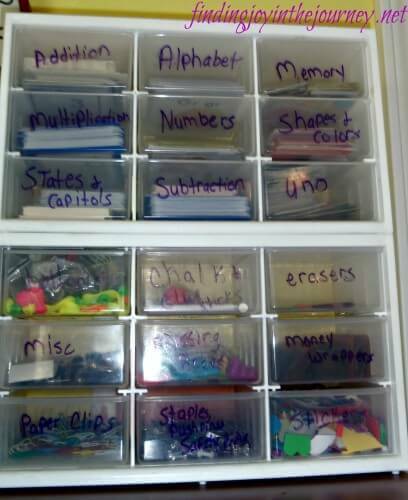 The file boxes contain math manipulatives (clear box), and worksheets (black box) that can be used for use later. Each cubby is labeled so there is no question about what goes in there 🙂 The school cubbies are organized so each child gets two cubbies. 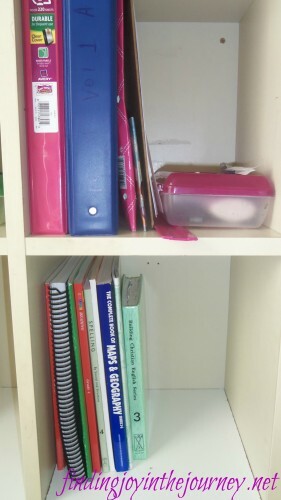 One cubby holds their portfolio, folder and school box, the other one holds all of their school books. After the first day of school I put the kids picture in their cubby just for fun! I went back and forth about having a desk in our homeschool room and am glad I decided to go for it! It gives me a place to grade papers, sit and teach, and write lesson plans. On my desk I keep our Mystery of History memory cards, the kids bible verse cards, pens, pencils and vocabulary words. Underneath the desk is where I store my teacher book, my Well Planned Day Planner, a garbage can and our cd player. 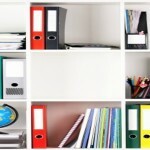 The paper organizer is sectioned off in “to be filed”, “needs graded” and “graded”. The kids put their finished work here until I grade it. If something needs filed in their portfolio it goes into “needs filed”. This system worked really well for us last year. The other side of the room is our play room. I have the room separated by a rug and our front door. 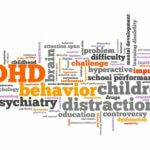 There is an imaginary line that the little ones know not to go over during “school time”. So, there you have it, our school room! It is not perfect, but it suits us just fine 🙂 We are excited to get back to school, and plan on starting next Monday!! If you have any questions about our homeschool room or organization please feel free to leave it in the comments! 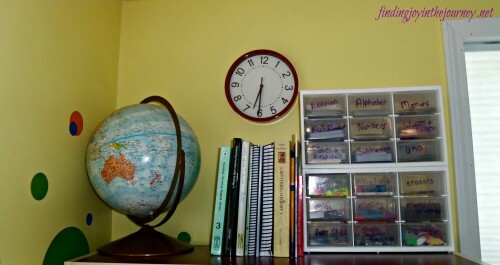 We have updated our homeschool room quite a bit since this post. Check out the NEW video below! 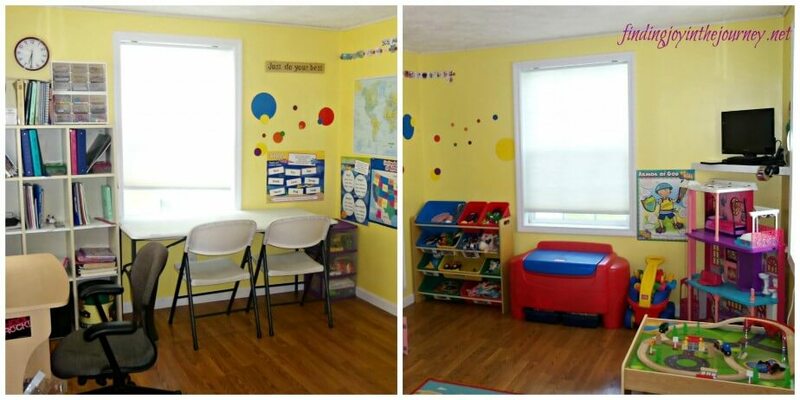 I love how cheerful your yellow walls make the homeschool room look! 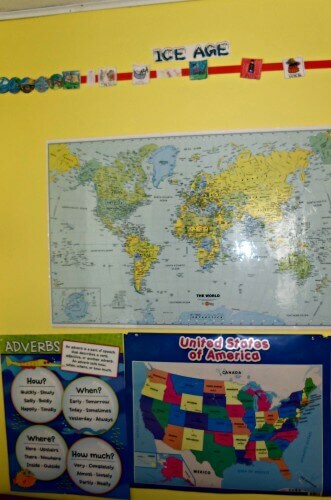 We have a similar style homeschool room with charts and maps, but yours is so cheery! Love the bright colors! 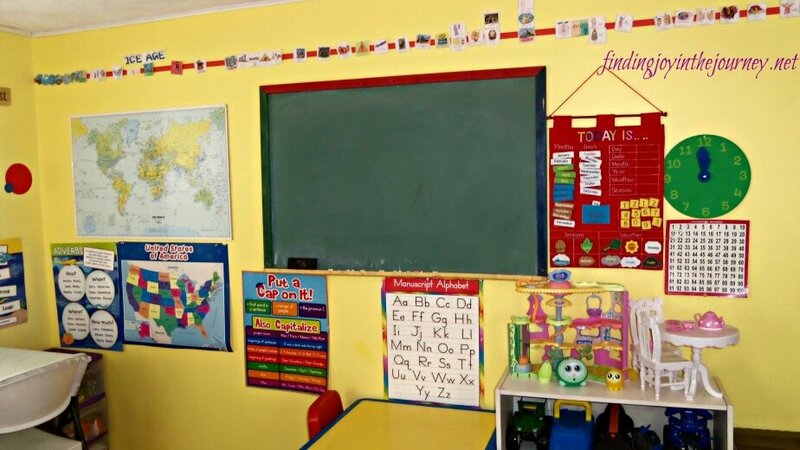 I love your homeschool room! But does that mean you don’t have a living room? Do you have another door that people go through to enter your house, so as not to disturb your schooling? Just wondering how you make a front room as a school room work. I would love to have such a big space like this for a homeschool room. Hi Jen!! Yes, we still have a living room! We took our front porch when we made our school/play room. Our main entrance is actually our back door, our front door is rarely used. Thanks for the nice comments! Such a bright and happy learning space! Cute room. Love the yellow. It makes everything look so cheery! What a lovely, colorful, friendly-looking space. Thanks for sharing! Such a lovely room! Love the organization! Wow! 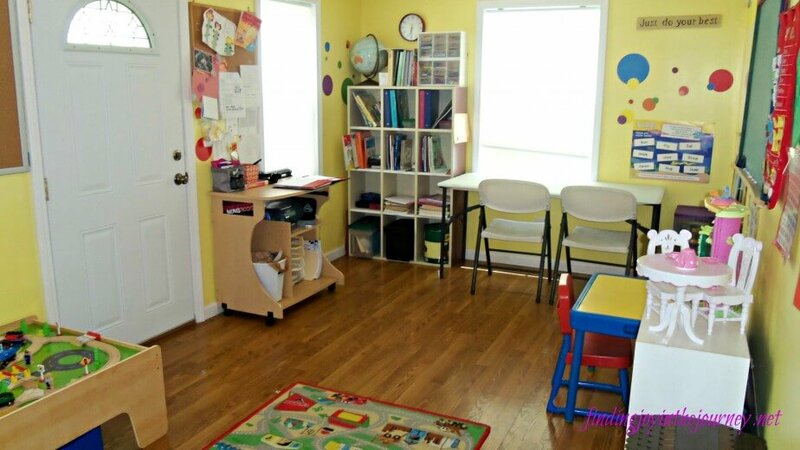 You have such a nice and well organized homeschooling space! 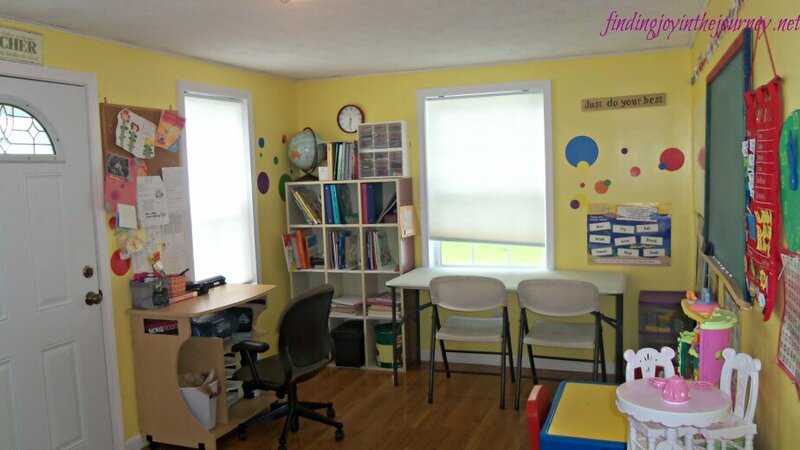 I tried having a homeschool room last year but it just didn’t work. We do best learning and exploring at the kitchen table (drat)! Thanks for sharing (and for taking the time to link up to the #SHINEbloghop – I love having you visit)! 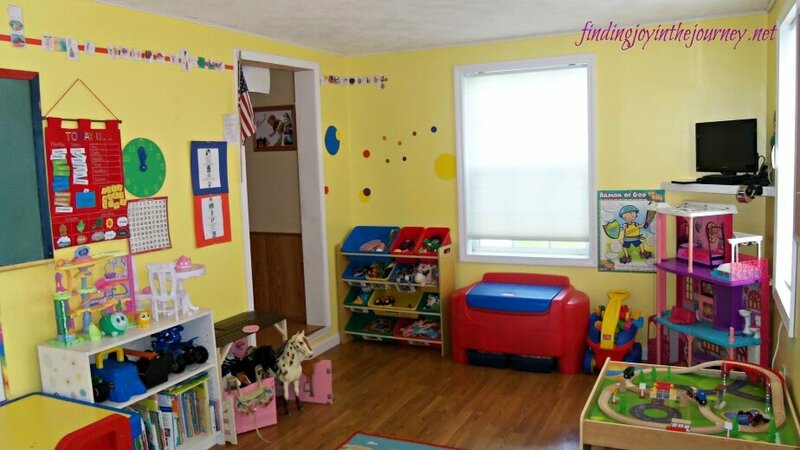 I love that you have a friendly space to learn and to keep everything tidy! Thank you for sharing with Mom’s Library, I’ll be featuring you this week at Crystal’s Tiny Treasures. Happy schooling! Thank you ladies for the nice compliments! Looks very organized and neat!